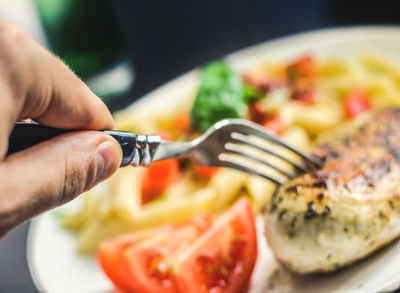 Every time we eat food, it may trigger an inflammatory response that acts as a protective mechanism to fight the bacteria consumed along with the food, a study has found. The findings showed that this inflammatory response, which acts as a protective mechanism, fails in overweight individuals leading to diabetes. On the other hand, in healthy individuals, short-term inflammatory responses play an important role in sugar uptake and the activation of the immune system. The study, led by researchers at the University of Basel in Switzerland, showed that depending on the concentration of glucose in the blood, the number of macrophages — a type of immune cell or “scavenger cells” — around the intestines increases during meal times and produces the messenger substance Interleukin-1beta (IL-1beta). This stimulates insulin production in pancreatic beta cells and prompts the macrophages to increase IL-1beta production. Insulin and IL-1beta work together to regulate blood sugar levels while IL-1beta ensures that the immune system is supplied with glucose and thus remains active. This mechanism of the metabolism and immune system is dependent on the bacteria and nutrients that are ingested during meals, the researchers said. With sufficient nutrients, the immune system is able to adequately combat foreign bacteria, said Erez Dror from the university. Conversely, when there is a lack of nutrients, the few remaining calories must be conserved for important life functions at the expense of an immune response, Dror added.